Today is the day for an avatar photo shoot. I am not one to take selfies. By the time I think of taking a selfie, the moment is usually over. Pointing the lens out towards the world is my preferred camera angle. I have very few current photos of myself to choose from. So I enlisted the help of one of my exotic models. Fluffy was happy to help. 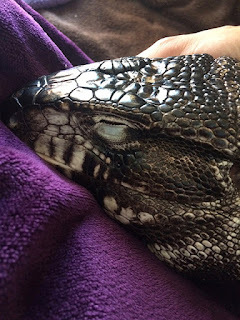 He's a four year old Argentine black and white tegu. 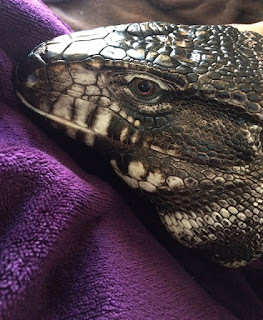 A big lizard. 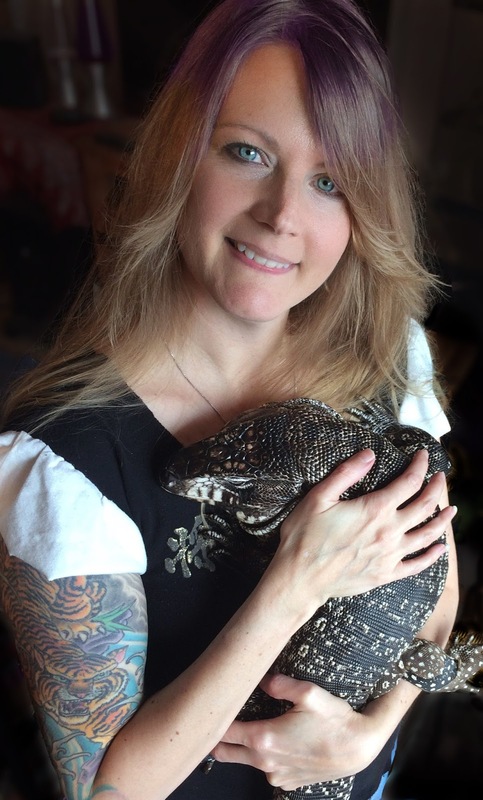 I got him as a baby from Madison's awesome reptile specialty store, Reptile Rapture. Even though the house is a little chilly at this time of year, Fluffy still loves to come out of his enclosure if the sun is out. Today it was. Fluffy is my hairless "dog". He's really quite friendly. I gave him the name because I didn't want people to be afraid. Most visitors chuckle when they learn what he's called. That's a good thing. It takes away the image of a scary four foot primordial lizard and replaces it with a less threatening image. I love natural light so we set up near the patio door. However, we still needed one studio light for fill. Working quickly--because sunlight is fleeting this time of year--we took a bunch of shots before we finally got the one I liked. It may not be the perfect avatar, but perfection is not the goal. To strive for perfection can drive an artist crazy, well anyone really. After the photo shoot, like a diva, Fluffy wanted to spend some time soaking in a warm bath (no bubbles). 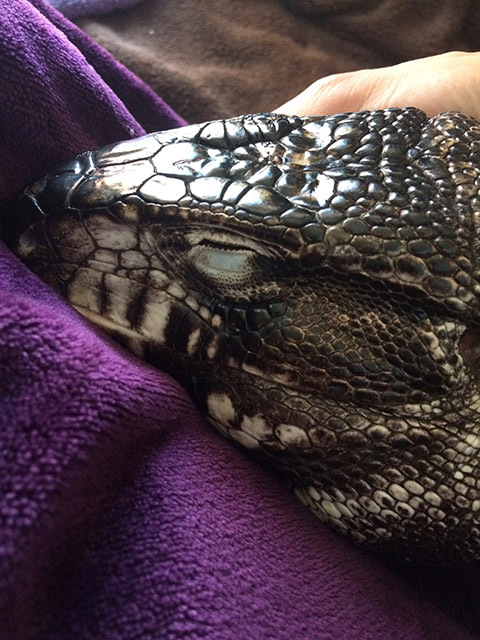 Then he got some cuddling in before retiring to his den. 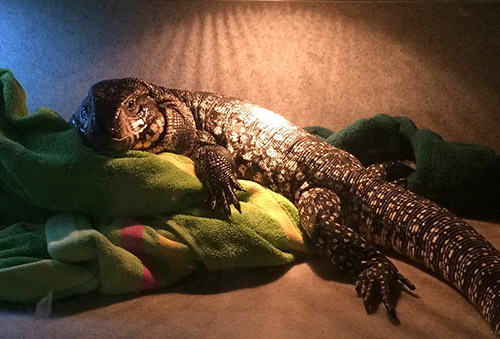 When it's chilly in the house, you don't stay away from your 120 degree basking spot for very long. Thank you to my husband, Robert, for taking the photo. I'll leave you with a quote that helps me get back on my artistic path when I stray. "We ask ourselves, Who am I to be brilliant, gorgeous, talented, fabulous? Actually, who are you not to be? Your playing small does not serve the world. There is nothing enlightened about shrinking so that other people won't feel insecure around you."